Our guide to Tampa will help you find the best frozen yogurt shops in Tampa Florida. Growth has changed most corners of Florida, and the Tampa Bay area is no exception, but planning and an abundance of preserves have shielded most of it from the overdevelopment that saturates much of the Atlantic Coast. Granted, this is one of the state's largest metro areas, but it is less fast-lane than Miami. Whereas Tampa has Florida's third-busiest airport and a vibrant business community, St. Petersburg and Clearwater have exceptional beaches, and the entire bay area has superior hotels and resorts that make this an excellent place to spend a week or a lifetime. There are tons of great frozen yogurt shops in the city of Tampa, our city guide will help you find the best frozen yogurt shops. You may have a hard time deciding what to do in Tampa, but we make your decision easy. 10023 N Dale Mabry Hwy, (813) 968-8015 - Stars Frozen Yogurt is a frozen yogurt shop located in Tampa FL. 10047 E Adamo Dr, (813) 374-9006 - Green Island self serve FroYo , fresh fruit smoothie, Boba milk tea, ice coffee & some japanese food. 1413 S Howard Ave, (813) 251-8383 - SunniBunni Frozen Yogurt & Organic Fruit Smoothies is a frozen yogurt shop located in Tampa FL. 218 E Davis Blvd, (813) 258-3377 - Esther's Cali Yogurt is a frozen yogurt shop located in Tampa FL. 2816 E Bearss Ave, (813) 443-5233 - Yogomisu is a frozen yogurt shop located in Tampa FL. 300 Westshore Plz, (813) 286-4747 - You Say When Yogurt Shoppe is a frozen yogurt shop located in Tampa FL. 3906 N Macdill Ave, (813) 831-9395 - Yogurt Naturally is a frozen yogurt shop located in Tampa FL. 4004 Henderson Blvd, (813) 288-8299 - Yogurt Naturally is a frozen yogurt shop located in Tampa FL. 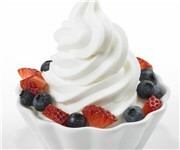 701 S Dale Mabry Hwy, (813) 873-2377 - Berryism Yogurt is a frozen yogurt shop located in Tampa FL. 8315 Sheldon Rd, (813) 888-5100 - Snow & Yogurt is a frozen yogurt shop located in Tampa FL. There are plenty more frozen yogurt shops in Tampa. See all frozen yogurt shops in Tampa Florida.